Dubai is now looking to be the smart and sustainable capital of the world, having embarked on a drive that extends beyond its ambitions of being a record setter. Beyond its ambition for superlatives, Dubai has embarked on a smart transformation, to empower, deliver and promote an efficient, seamless, safe and impactful city experience for residents and visitors. So, in line with its vision of being the smart and green capital of the world, the buzzwords that are beginning to impact the way the construction industry operates are sustainability, BIM (business information modelling), renewable energy, artificial intelligence, and autonomous transportation. Leading from the front are Dubai’s Road and Transport Authority (RTA) and Dubai Electricity and Water Authority (Dewa), which are already reporting success of their various initiatives. Dubai is aiming to increase the share of clean energy to 25 per cent by 2030 as part of its Clean Energy Strategy 2050. Underpinning this drive is the Mohammed bin Rashid Al Maktoum Solar Park project which will have a whopping 3,000 MW of capacity while reducing 2.4 million tonnes of carbon dioxide emissions annually. The ambitious project involves a total investment of Dh16 billion ($4.3 billion). The emirate is also spearheading a smart city initiative, which is permeating across all sectors – right from electricity generation and transmission, through deploying solar panels at the household level to transportation. The ‘Smart Dubai Strategic Plan’, which was launched in 2015, looks to leverage smart applications to improve demand management and prevent wasteful consumption – particularly for water and electricity. However, this is not to say Dubai’s ambition for superlatives is satiated – the emirate early this year revived plans to build yet another super-skyscraper, having already initiated work on a tower that will supersede the world’s tallest Burj Khalifa. Dubai tops the list of the world’s megacities for construction projects with the total value of projects in pipeline amounting to $374.2 billion, according to GlobalData, a leading data and analytics company. In the second place is London with $328.7 billion projects and Moscow is in third spot with $191.5 billion. An active real estate market and government-supported infrastructure spending in transport and utilities will continue to provide construction growth opportunities, according to Fitch Solutions. A major catalyst in its current buoyancy has been Dubai’s successful bid to host the 2020 World Expo, a six-month event during which the emirate will be a global destination for millions of people to share ideas, showcase innovation, encourage collaboration and celebrate human ingenuity. This will be the first time that the world-class event is held in the Middle East. The showcase is expected to cost between $2 billion and $4 billion and welcome some 25 million visitors between October 20, 2020 and April 10, 2021. As the 20.10.20 date draws, Dubai is seeing heightened activity and increased investment inflows in preparations to host the event. At the 4.38-sq-km site in Dubai South, construction is well advanced with all buildings continuing to rise above ground level. Dubai has been building on its global appeal as a tourist and retail destination, and with the countdown now started for the Expo 2020 Dubai, work on numerous hotels, shopping malls and entertainment destinations is gaining momentum. Among the latest projects that have taken off is Sport Society, the world’s largest retail destination for sports. Major centres of activity have been in and around Dubai South, with many developers touting their projects’ proximity to the World Expo site. The government has been making concerted efforts to maintain the momentum in the construction sector. However, it cannot be denied that business confidence is low and competition severe. According to a Fitch Solutions report, weak real estate prices and rents will continue to weigh on growth in Dubai over the coming quarters. 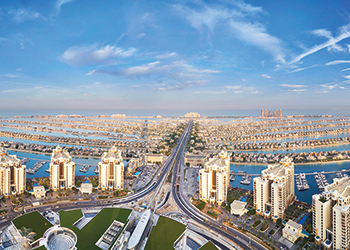 Property values in the emirate have fallen by 22.7 per cent since their Q3 2014 peak, owing to a combination of low oil prices and associated economic weakness, tighter mortgage regulations and rapid supply growth. Over the longer term, Fitch Solutions believes that regulatory changes may be needed to support the sector. In order for real estate and construction to remain reliable drivers of Dubai’s economic activity, demand for property will need to pick up more substantially from current levels so as to boost prices. To accommodate the growing number of business and leisure visitors entering or transiting Dubai, the emirate has been continuously expanding and upgrading Dubai International Airport, which welcomed more than 89.1 million passengers in 2018. It also has put in place plans for a major expansion of its second airport, Al Maktoum International Airport, which is set to become the primary airport for the emirate, as well as the home to Emirates airline from 2025. A contract award is expected shortly for the largest substructure package in the world for the development. In the roads sector, the RTA has been making impressive strides to enhance the road network leading to the Expo 2020 site. Work is under way on the last two phases (Five and Six) of the roads leading to the site, under contracts worth Dh630 million awarded last October. In February, the RTA opened a main bridge at the intersection of Expo Road and Al Asayel Street, part of Phase Five, construction on which is set to be finished this June. Another key Expo 2020 transportation project is the Route 2020 metro network. The new route covers the 15 km extension of the Dubai Metro Red Line to the site of Expo 2020 and includes seven stations (see also UAE Focus, Pag 26). Among other key projects is the Dh394-million Shindagha Bridge, which is being developed under the third phase of the Dh5.04-billion ($1.37 billion) Shindagha Corridor Project, following the completion of the first two phases. The project will be completed in 2022. The Shindagha Corridor Project extends 13 km along Sheikh Rashid Street as well as Al Mina, Al Khaleej and Cairo streets. Work is under way on the third and fourth phases of Mohammed bin Rashid Solar Park, which is considered to be world’s largest renewable energy project. A consortium led by Abu Dubai Future Energy Company (Masdar) is building the 800 MW third phase, while Saudi-based Acwa Power is the lead developer of the 950 MW fourth phase. Phase Four, initially expected to deliver 700 MW of energy, will use a combination of a 260-m-high solar tower (the world’s tallest of its kind) that will generate 100 MW, three stations of parabolic trough concentrated solar power (CSP) each producing 200 MW, and 250 MW generated from photovoltaic panels to yield a total capacity output of 950 MW. This phase is the largest investment project in the world using CSP on a single site. Meanwhile, work continues on Dubai’s conventional power projects with the expansion of Jebel Ali M-Station – the largest in the UAE – close to completion. The combined total cost of the construction and expansion of M-Station – whose total capacity will reach 2,885 MW – is close to Dh11.5 billion. Dewa also intends to boost its transmission network and is set to award contracts worth Dh11.4 billion for the construction of 85 new 132/11-kV substations and six 400/132-kV substations over the next three years. Dewa needs to invest Dh81 billion over the next five years to meet the growing demand for energy, stated managing director and CEO Saeed Mohammed Al Tayer. In the sewerage sector, Dubai Municipality is currently implementing key infrastructure development projects worth Dh6.5 billion, including the Dubai Deep Tunnel Storm Water System and the world’s largest single waste-to-energy plant in the Warsan area. Expo 2020 Dubai: Over the past year, key contracts have been awarded for work on the Expo 2020 Dubai site as countries around the world continue to unveil eye-catching designs for their own pavilions at the world-class event. Early this year, Dubai-based Arabtec Construction secured a Dh169-million deal to complete 29,000 sq m of public space next to Expo 2020’s iconic centrepiece, Al Wasl Plaza, including building a 5,000-sq-m water park, restaurants, utilities and landscaping. This follows a Dh311-million contract for the construction of the public realm in concourses and arrivals plazas (see Page 48). Museum of the Future: Work on the Museum of the Future on Sheikh Zayed Road is progressing at a steady pace and the striking landmark is on track for opening in 2020. Structural work on the project was completed late last year. It will be one of the most advanced buildings in the world and will feature a unique design with Arabic calligraphy inscribed onto the exterior. The Museum of the Future is considered to be a unique incubator for futuristic innovation and design. The project is designed by Killa Design and will be built in part using 3D printing technologies, and will change over time to reflect the latest advancements in various fields. The contractor on the project is BAM International. DIFC expansion: A massive expansion of the Dubai International Financial Centre (DIFC) – which will triple the size of the financial hub – was given the go-ahead early this year. DIFC 2.0, the new expansion, will add a total of 13 million sq ft of space to the centre’s integrated ecosystem. The new development will provide an international focal point for FinTech and innovation, enhancing the centre’s reputation as one of the world’s most advanced financial centres. The development of DIFC 2.0 is expected to commence immediately and will be completed in several stages. Despite the subdued demand in the real estate sector, Dubai continues to see the launch of new projects at a regular frequency. Among the projects that hit global headlines was the launch early this year of the 550-m-high Burj Jumeira by Dubai Holding. The tower will be the centrepiece of a new pedestrian-friendly mixed-use urban destination in Al Sufouh. The striking high-rise has been designed by US’ Skidmore, Owings & Merrill (SOM), which is now working on the masterplan for the surrounding Downtown Jumeira district. Construction will kick off immediately with Phase One of the development set to be delivered in 2023, according to Dubai Holding. Among other recent launches by Dubai Holding is the 3.85-million-sq-ft luxury residential development, Madinat Jumeirah Living, located opposite the landmark Burj Al Arab. The project is expected to break ground this year and will be developed in phases. Dubai Holding has also joined hands with Emaar to spearhead the development of the massive Dubai Creek Harbour development, where a series of projects have been unveiled over the past year. The 6-sq-km mega-development will feature world-class hotels, green parks and gardens, cultural attractions, canals, parklands, landscaped promenades, pedestrian walkways and cycle paths. The centrepiece of the development is the iconic Dubai Creek Tower, designed by Spanish/Swiss architect and engineer Santiago Calatrava Valls, featuring several observation decks. Concrete placement for the pile cap of the architectural marvel was completed in June last year and the appointment of the main contractor is awaited. Early this year, Emaar launched Palace Residences, a five-star waterfront branded residential development within the Dubai Creek Harbour development. Palace Residences by Address Hotels + Resorts is being designed for boutique waterfront living only steps away from two waterfront destinations – Creek Marina and the Creek Beach. The world-class city-harbour getaway Creek Marina, in the heart of Creek Island Dubai, will boast a capacity of 81 single- and double-berths and will feature a world-class yacht club with an impressive array of shopping and dining facilities. It will also be home to the Vida Harbour Point, a 286-room upscale lifestyle hotel. Other highlights of the project include a gravity-defying interactive fountain, art installations, a sculptural viewing deck and three intertwined ring walkways at the Creek Marina Terminus, and over 1,500 parking spaces. The mega development, meanwhile, is expected to welcome its first residents shortly within Creek Island Dubai, a premier district in Dubai Creek Harbour which is destined to be home to 33,500 people. The first homes to be delivered are in Dubai Creek Residences, a six-tower residential development with only 872 residences. Work on the other residential developments launched in Creek Island Dubai is progressing as per schedule. These include Creekside 18, with 500 apartments, Harbour Views with 762 apartments, and The Cove, a low-rise waterfront sanctuary, with 276 apartments, all of which are to be handed over in the first half of 2020. Creek Horizon, featuring 556 apartments is due for handover in mid-2020. Other upcoming residential developments in Creek Island Dubai are Creek Gate (490 apartments); Creek Rise (543 apartments), Creek Horizon (556 apartments) and Harbour Gate (505 homes), all of which are targeted for 2020 handover. Dubai Holding and Emaar Properties are also jointly developing Dubai Square, a new retail metropolis in Dubai Creek Harbour. Dubai Square represents a 2.6-million-sq-m retail, hospitality and residential district that will be linked directly to the iconic Dubai Creek Tower through a cutting-edge underground extension. Emaar has also announced plans to develop the Middle East’s largest Chinatown within the retail district of Dubai Creek Harbour. Meanwhile, Emaar Development, the UAE build-to-sell property development business majority-owned by Emaar Properties, unveiled the Burj Royale residential apartments in Downtown Dubai late last year. This followed the earlier launch of the Grande, a 78-storey residential tower located in the heart of The Opera District in Downtown Dubai. • Nakheel: The master developer of the Palm projects that have helped to put Dubai on the global map, Nakheel is working on its latest Deira Islands, where it has so far invested more than Dh8.8 billion in infrastructure and project construction. Work is in progress on the Dh670-million beachfront resort and water-park being jointly developed with Spain’s RIU Hotels & Resorts and on a Centara Resort (see Page 52). Meanwhile, at its Palm Jumeirah, work is well advanced on The Palm Tower, a 52-storey, luxury hotel and residential complex with construction of the rooftop dining viewing deck complex set to begin soon. The Palm Tower comprises a 289-room St Regis hotel on the first 18 floors with 432 luxury residences on the upper floors. Fit-out of the St Regis – due to open later this year – is in progress. Another iconic development coming up on Palm Jumeirah is Palm360, a two-tower luxury hotel and residential landmark project. The tallest building on Palm Jumeirah at 260 m, Palm360 will comprise Raffles The Palm Dubai Hotel and Raffles Residences Palm360. The project is due for completion in 2021. Work on The Pointe, Nakheel’s Dh800-million waterfront dining and entertainment destination on Palm Jumeirah, was completed last year. Another landmark Nakheel project is the Dh713-million Dragon Towers within the Dragon City mixed-use community, work on which is under way. The twin-building project, due for completion in 2021, is the first residential component at Dragon City and the only high-rise in the area. • Meraas: Bluewaters – Meraas’ mixed-use island destination being developed on a manmade island off the Jumeirah Beach Residence coastline – marked a milestone early this year by welcoming its first residents. Bluewaters Residences comprises 10 mid-rise towers featuring 698 apartments, four penthouses and 17 townhouses set amidst a plethora of world-class entertainment, leisure and hospitality options. These include The Wharf, Bluewaters’ lifestyle retail space, which will comprise over 150 retail and dining outlets that dot the boulevard as low-rise structures. Meraas is also developing Dubai Harbour, which will be the first yachting community hub in the Middle East. Located between Bluewaters and Palm Jumeirah, Dubai Harbour is being built over an area of 20 million sq ft and will include retail, restaurants, cafés, luxury residences, hotels and Dubai Lighthouse, a 150-m-high architectural masterpiece destined to become a feature landmark building. Its exclusive marina at Dubai Harbour will be the biggest in the Middle East, featuring three distinct marina bays. Work is also well in progress on its Dubai Arena project, which is earmarked for opening this year. The venue, which can accommodate 17,000 visitors, is located at the lifestyle destination City Walk. Another project being developed by Meraas at City Walk is Central Park, an exclusive residential neighbourhood comprising 12 terraced mid-rise residential buildings which will surround a 40,000-sq-m park. Other projects launched by Meraas recently include the third phase of The Yard, a social hub in the heart of an upscale residential area in Al Khawaneej, and Port de La Mer, a residential neighbourhood at La Mer, a Dubai beachfront destination. • Dubai Multi Commodities Centre (DMCC): DMCC has flagged off work on the first supertall tower at its Uptown Dubai district with the appointment of Belgian builder Besix as the contractor. The project was first announced in 2013 as Burj 2020. Designed by Adrian Smith + Gordon Gill Architecture, the 78-storey building will boast luxury hotel rooms and suites, high-end restaurants, health spas, conference facilities, Grade A offices, and 237 branded residences. • Damac: Damac Properties delivered a total of over 4,100 units in 2018, the highest number completed by the company within one year. The units delivered were spread across flagship projects Damac Towers by Paramount Hotels & Resorts Dubai, Damac Heights, Damac Majestine, Avanti Tower, as well as several mid-rise buildings and villas within Damac Hills, it states. Damac has this year launched its ready-built concept, Golf Town, located within Damac Hills, a popular gated-community. Construction, meanwhile, continues at its second residential community in Dubai, Akoya Oxygen, where contracts worth more than Dh6 billion were awarded last year. Another landmark development under way is Aykon City, a four-million-sq-ft development which is slated for completion in 2021. The mixed-use development includes premium residential, hospitality and commercial units and will also have seamless access to the 3.2-km-long Dubai Water Canal. • Meydan Group: More than 60 per cent of the structural work has been completed on Meydan Group’s next-generation lifestyle and retail destination, Meydan One, and the project is on track for launch in 2020. The $2-billion Meydan One will feature an incubation district as a fully-enabled plug-and-play facility for up-and-coming entrepreneurs in fashion, beauty and food and beverages (F&B), among others. Upon completion, Meydan One will host 580 retail stores including 30 anchor stores and 80 flagship luxury stores, 190 dining outlets and a 13,200-sq-m hypermarket. • Union Properties: Union Properties is developing The Avenue District, a multi-use urban lifestyle community as part of Motor City’s Phase Two expansion. Worth Dh2.5 billion, the 2-million-sq-ft project will include a variety of apartments and the One Avenue Mall, a 1.3-million-sq ft retail centre. Motor City is an entertainment destination, spanning over 38 million sq ft and located on Mohammed bin Zayed Road. • Dafza/Wasl: Dubai Airport Freezone Authority (Dafza) and UAE developer Wasl Asset Management Group have launched work on their ambitious Dh3.2-billion Dubai CommerCity project over an area of 2.1 million sq ft in Umm Ramool. Dubai CommerCity is aimed primarily at global and regional manufacturers, distributors and global and regional e-retailers, as well as ecosystem companies in the e-commerce industry. • MAG: MAG Lifestyle Development (MAG LD) is developing the Dh2.2-billion MAG Creek Wellbeing Resort, which is expected to be completed in 2021. The resort includes a 120,000-sq-ft World Care Wellness Centre, the largest wellness centre in the world. The community also includes a luxurious 96-room World Care Wellness Hotel, a sports, fitness, and leisure centre, and a wide variety of restaurants, cafés, and retail outlets. • Azizi: Azizi Developments has several developments at various stages of construction throughout the emirate. Among them are the Azizi Riviera, its flagship Dh12-billion waterfront community project comprising 16,000 residential units at Meydan One; the Dh470-million Azizi Aliyah Residence in Dubai Healthcare City (DHCC); and the Dh265-million Shaista Azizi, one of its five projects in Al Furjan.